For some time now, I’ve had a saved search on eBay for ‘spares-or-repairs’ musical equipment, since I enjoy fixing stuff and it’s always interesting to get some new noise-making/-mangling equipment isn’t it? 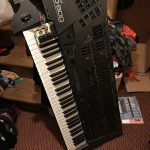 November saw me purchasing a rather sorry-looking Roland JD-800 (I’d not really been looking for one, but it came up at a reasonable cost — £210 all in — so I thought I’d take a chance). Obviously something had been dropped on it at some point in its life, but the seller stated that the keyboard worked and that some of the buttons needed a bit of pressure to activate, but that the synthesiser was basically working. The obvious cosmetic damage was something to be thought about for the future, so I was interested in getting to grips with getting it functional again — initial assessment wasn’t great: none of the sound-selection buttons worked (so it was stuck on patch 23), and some of the sliders were a bit jumpy. 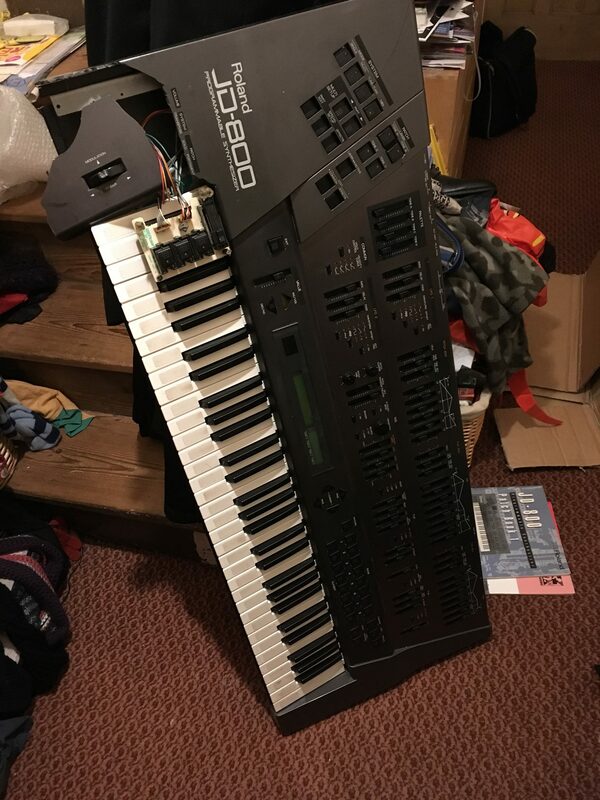 This was going to be a bit more work than I had first thought (however since JD-800s usually sell for £400+, I had a bit of room for repair costs!). An unexpected find was the famous Red Goo problem — of which I was unaware before I got the keyboard. It turns out that the glue used by Roland to stick the weights onto the keys in the 1990s was of an unstable composition and, over time, it oozes and drips into the keybed; this is a problem as there are delicate circuit boards and contacts in there. Fortunately, although this keyboard had the Red Goo, it had not yet affected the keybed. Find a replacement for the smashed left-hand-end. (This is a really old topic but I wanted to capture it somewhere). 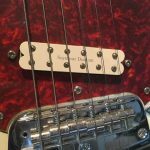 I have a Japanese reissue Fender Mustang which I love dearly, but I wanted to get a bit more tonal variation (and I was also getting a bit cheesed off with having the sound cut off if I nudged the pickup-selector switches whilst playing). 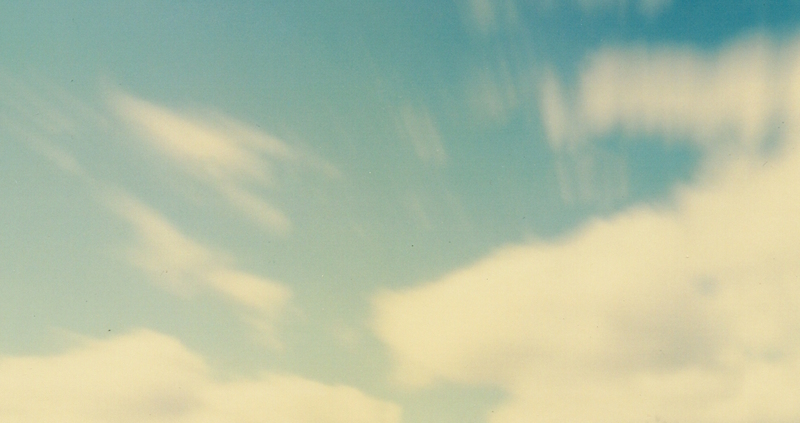 Here’s a short description of the modifications I made to improve things. 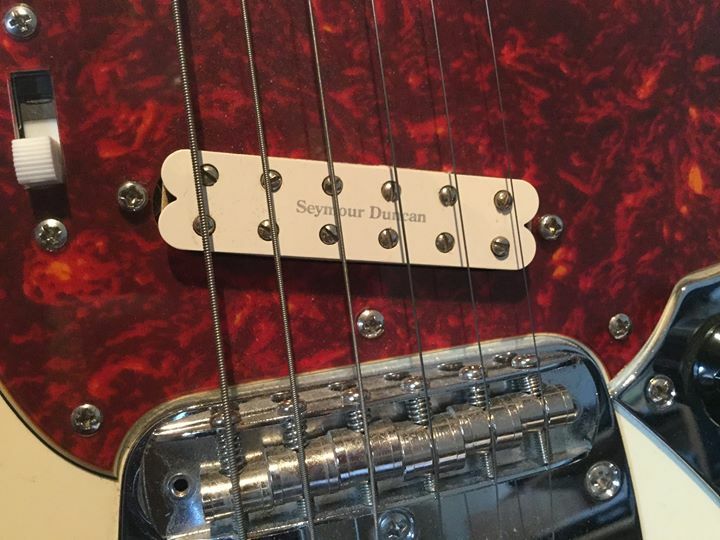 Item 1: change the bridge pickup (to a Seymour Duncan Lil’ 59 small humbucker). I figured that with the humbucker in place I’d be able to get a few more tones, especially if I added a coil shunt to get single-coil tones too. I wired the switch next to the bridge pickup like this, where R, W, G and B stand for the Red, White, Green and Black wires from the pickup. The three positions of the slide switch now give three combinations of the coils (parallel, series, and single coil). The neck-switch is wired as a simple pickup selector (neck, neck+bridge, bridge), feeding into the regular tone and volume controls. This gives a much wider range of pickup configurations (7 if I can count correctly), and I’m pretty pleased with how it’s come out.